Animals offer companionship and comfort to their owners, but they also provide other therapeutic benefits. Elderly people who are sick, undergoing surgery, or managing depression are perfect candidates for a program known as pet therapy. Doctors, home care providers, and nursing homes may recommend pet therapy to these clients in the hopes of improving their physical, mental, and emotional states. Rhode Island Home Care Assistance can attest to the perks of pet therapy, and we hope the following information will encourage family members to look into the service for their loved ones. 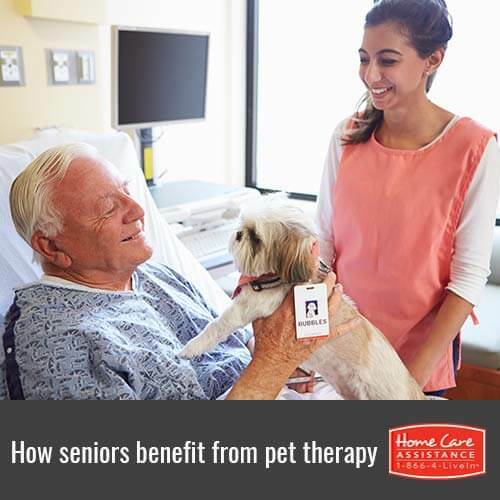 A senior who receives pet therapy is likely to have lower blood pressure and stronger heart health. The calming effect from the companionship of a therapy pet encourages relaxation, thereby decreasing physical pain and illness for the senior. This is particularly helpful for seniors who experience chronic pain or who receive chemotherapy treatments because petting animals produces endorphins, which reduces physical and emotional pain. Therapy pets also help seniors by relieving them of stress or loneliness, thus reducing the risk of depression and anxiety. Senior citizens can talk to and snuggle with trained pets, giving elderly people comfort knowing they are not alone. Dogs and cats can also provide entertainment to seniors, which helps stimulate their cognitive skills and sharpen mental acuity. Pets are naturally therapeutic, so at times, hospitals, assisted living facilities and retirement homes welcome therapy pets as a source of treatment. While these animals are specially trained by their owners, they aren’t certified and don’t help seniors with daily tasks like service dogs. Additionally, therapy animals aren’t strictly limited to one species. They can also be hamsters, guinea pigs, or fish. While Home Care Assistance doesn’t provide therapy animals, it is one such entity that encourages the use of therapy pets for ailing seniors through other programs. Call us at 401.284.0979 today and ask about other care services we do provide, like stroke, dementia, Parkinson’s, and Alzheimer’s home care for seniors in Rhode Island. Our dedicated caregivers can offer comprehensive care, comfort, and support to your loved one. We look forward to hearing from you.